Home > Departments > Faculty > Li Han Ph.D.
Li Han received a B.S. and an M.S. in Biomedical Engineering from Xi'an Jiaotong University in 1989 and 1992 respectively, and a Ph.D. in Computer Science from Texas A&M University in 2000. She was a postdoc fellow at Carnegie Mellon University from 2000 to 2002. She has been with Clark since 2002. Professor Han's main research interests are in robotics and computational protein folding. 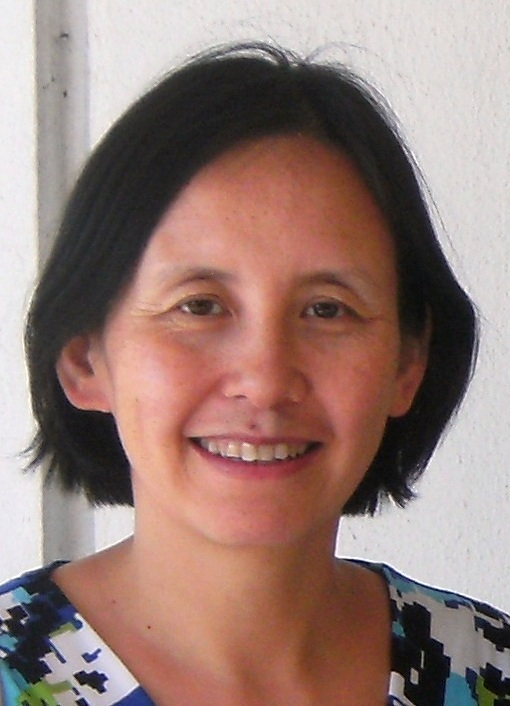 Her recent work focuses on the computational study and mathematical analysis of configuration spaces and motions of multibody systems such as robots and proteins. Professor Han enjoys teaching a wide variety of courses. She is the faculty advisor of Clark Competitive Computing Club (C4) and the coach of Clark programming contest teams. H. Liu, Q. Tan, L. Han, and S. Huo, " Observations on AMBER Force Field Performance under the Conditions of Low pH an High Salt Concentrations ", Journal of Physical Chemistry B, 121 (42), 9838-9847, 2017. M. Duan, M. Li, L. Han, and S. Huo, " Euclidean sections of protein conformation space and their implications dimensionality reduction", PROTEINS: Structure, Function, and Bioinformatics, 82(10), 2585-2596, 2014. M. Li, M. Duan, J. Fan, L. Han, and S. Huo, "Graph representation of protein free energy landscape", Journal of Chemical Physics, Vol.139, Issue 18, Nov. 2013. M. Duan, J. Fan, M. Li, L. Han, and S. Huo, "Evaluation of Dimensionality-reduction Methods from Peptide Folding-unfolding Simulations", Journal of Chemical Theory and Computation, April 2013. J. Fan, M. Duan, D. Li, H.Wu, H Yang, L. Han, and S. Huo, "Observation of Two Families of Folding Pathways of BBL", Biophysical Journal, 100(10), May 2011, pp. 2457-2465. Li Han, Lee Rudolph, Jonathon Blumenthal, and Ihar Valodzin, "Convexly Stratified Deformation Spaces and Efficient Path Planning for Planar Closed Chains with Revolute Joints," International Journal of Robotics Research, 27(11-12), pp. 1189-1212, November 2008. Dawei Li, Haijun Yang, Li Han, and Shuanghong Huo, "Predicting the Folding Pathway of Engrailed Homeodomain with a Probabilistic Roadmap Enhanced Reaction-path Algorithm," Biophysical Journal 94, 1622-1629, 2008. Dawei Li, Li Han, and Shuanghong Huo, "Structural and Pathway Complexity of beta-Strand Reorganization within Aggregates of Human Transthyretin(105-115) Peptide," Journal of Physical Chemistry B,111: 5245-5433, 2007. Web Release Date: 14-Apr-2007; (Article) DOI: 10.1021/jp0703051. Haijun Yang, Hao Wu, Dawei Li, Li Han, and Shuanghong Huo, "A Temperature-Dependent Probabilistic Roadmap Algorithm for Calculating Variationally Optimized Conformational Transition Pathways," Journal of Chemical Theory and Computation, 2007; 3(1) pp 17 - 25; Web Release Date: November 15, 2006. (Article) DOI: 10.1021/ct0502054. M. Duan, L. Han, L. Rudolph, and S. Huo, "Geometric Issues in Dimensionality Reduction and Protein Conformation Space", Workshop on Robotics Methods for Structural and Dynamic Modeling of Molecular Systems, Berkeley, CA, July, 2014. L. Han, L. Rudolph, S. Corbett, M. Chou, E. Eagle, D. Glotzer, J. Kramer, J. Moran, C. Pietras, A. Tareen, and M. Valko, " Configurations and Path Planning of Convex Planar Polygonal Loops", Tenth International Workshop on the Algorithmic Foundations of Robotics (WAFR 2012) , E. Frazzoli, T. Lozano-Perez, N. Roy, and D. Rus, eds., Springer Track in Advanced Robotics, Springer, Berlin / Heidelberg, June 2012. L. Han and L. Rudolph, "Explicit Parametrizations of the Configuration Spaces of Anthropomorphic Multi-Linkage Systems," Robotics: Science and Systems Conference V (RSS2009), June 2009, Seattle USA, in press at MIT Press.